688 Attack Sub is a submarine simulation game designed by John W. Ratcliff and Paul Grace, published in 1988 for MS-DOS systems and 1990 for Amiga computers by Electronic Arts. A Sega Mega Drive version was also published. 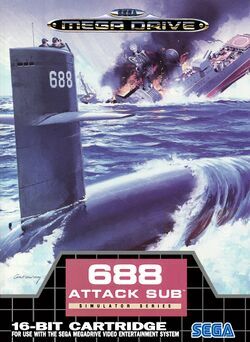 688 Attack Sub is known as an early classic of the genre. John W. Ratcliff followed it up by SSN-21 Seawolf later. The player takes command of a US Los Angeles-class or Soviet Alfa class nuclear powered attack submarine and plays 10 missions organized into a Cold War scenario. This was one of the earliest games that allowed two players to play against each other over a modem (or null modem cable). This page was last edited on 8 June 2012, at 11:08.